I've been struggling with a lot of personal issues of late, and then struggling over whether or not to blog about it. But since I've benefited so much from reading people's experiences online, I might as well add mine. I was recently diagnosed with Hashimoto's Thyroid disease, which has explained a lot of my symptoms of late. Unfortunately it's a slow process that starts with a bunch of blood testing for food allergies. As I wait for the results, I'm still trying to resume cooking and baking like normal, even though they recommend I go off gluten (yes, I cried about this). 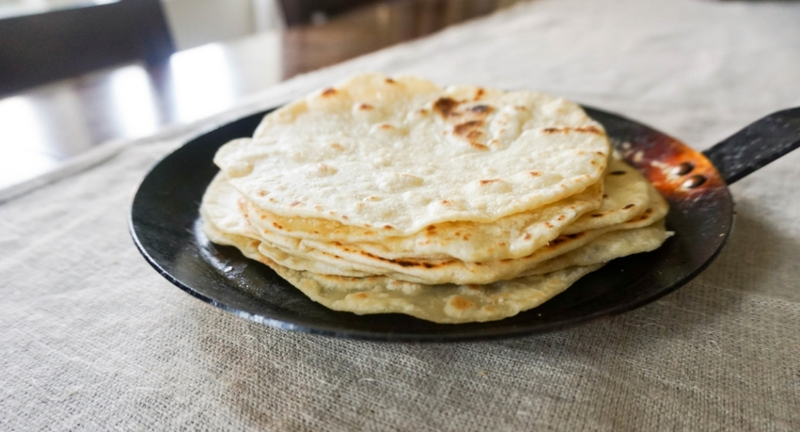 I've always wondered how easy tortillas might be to make--they look and taste so similar to rotis or chapatis. There are also often random preservatives and unnecessary ingredients in store-bought tortillas so I wanted to try my own hand at them. They are way, way easier than I even expected. It's super easy to spend a Sunday afternoon cooking a bunch of these and freezing them away for a later time. I wouldn't blame you for opting for store-bought but these are a very good option if you want to know exactly what's going into your food. I used the tortillas to make a taco torte as seen on Smitten Kitchen. 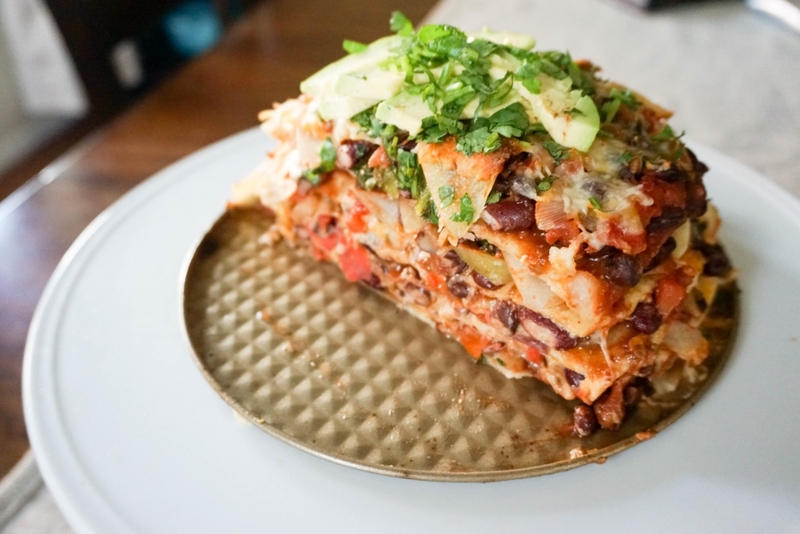 It's like a savory Mexican cake or stacked pizza. It's addictive and delicious and adaptable to whatever you might have in your kitchen at the time. Use whatever greens and veggies you have and any meats (or skip the meats and keep it veg) to quickly throw it together. 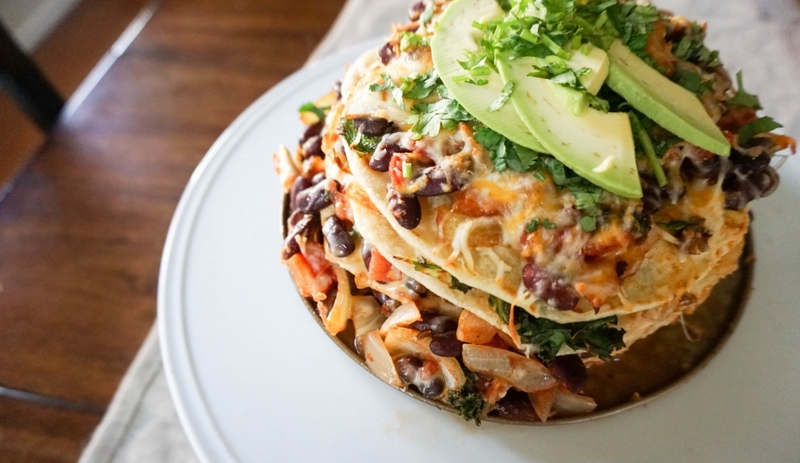 This is truly a great weeknight meal dish that is a fun twist on a Mexican dinner. It may take slightly more effort to stack and bake but it makes you feel fancy on an otherwise dreary middle of the week. In a large mixing bowl, use your hands to mix together the flour, salt and baking powder. Add the oil and water and knead until the dough comes together until the dough is smooth, about 2 to 4 minutes. Transfer the dough onto a floured work surface and divide into 8 equal portions. Roll each piece into a ball and then flatten with your hands, adding more flour as needed to keep from sticking. Place on a large plate, cover with a clean towel and let rest 15 minutes. Roll each piece of dough into a rough circle about 6 to 7 inches in diameter. Set aside in a single layer. Place a large pan over medium-high heat. When the surface is very hot, add 1 tortilla and toast 1 minute, until the bottom has a few pale brown spots. Flip and toast another 30 seconds, until both sides have a few light brown blisters. Remove from the pan with tongs and stack in a covered container or zip-top bag. Repeat with remaining tortillas, wiping out the pan between each to collect any excess flour. Serve warm or let cool for later use. Tortillas will keep, frozen and separated with parchment paper and stored in a zip-top bag. • Heat the oven to 400 degrees. Line a 9-inch round cake pan with foil and spray with nonstick spray. Set aside. • In a large skillet over medium heat, warm the oil, then add the onion, garlic, jalapeno (if using) and cumin, and saute until the onion is softened until the cumin is fragrant, about 3 minutes. • Stir in the tomatoes and tomato paste, then the beans. Season with salt and pepper to taste. Simmer until everything is hot, about 3 minutes. • Add the corn and kale and stir until the leaves are wilted and everything is well combined. Season to taste. • Place 1 tortilla in the prepared cake pan. 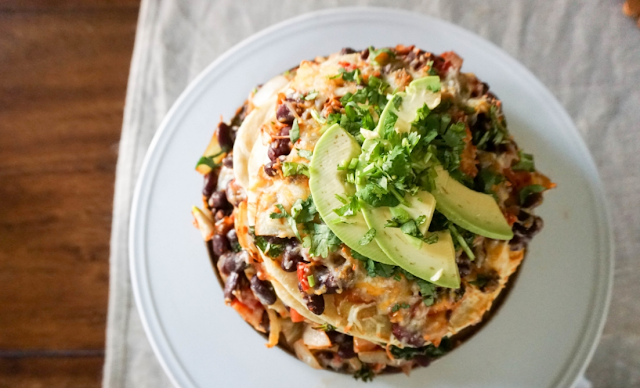 Spread one-sixth of the bean mixture evenly over the tortilla, then sprinkle ¼ cup cheese evenly over the top. Repeat with 5 more layers, ending with the last of the bean mixture and shredded cheese. • Bake until the top is lightly browned, about 20 minutes. Let rest 5 minutes before removing it from the pan by carefully lifting the foil. Sprinkle with chopped cilantro. • Cut into wedges and serve with sour cream, salsa or avocado. *Stir in cooked ground meat or sausage if you want!